**** Chosen by Winner: James W.
This is a collaboration project specifically for Knife Rights' Ultimate Steel™ led by knifemaker Johnny Stout. The engraving was donated by Joe Mason, the Mosaic Damascus steel was donated by Chad Nichols Damascus and the Mammoth Ivory handle material was donated by Fine Turnage Productions. The Amigo is a "pocket friendly" sized version of Johnny Stout's acclaimed "Vaquero" Double Action Automatic linerlock folder. This is the first of this model that Johnny has crafted and going forward will be built primarily to order and is unlikely to be available to purchase off his table. It is another of Johnny's timeless elegant designs with the Mosaic Pattern Damascus bolsters providing a dramatic canvas for Joe Mason's exquisite 24K Gold inlaid engraving. "Double Action" means that the blade can be deployed automatically with the push of the Ruby inlaid 24K Gold button in the handle or the blade can be opened manually using the Ruby inlaid 24K Gold thumb stud. 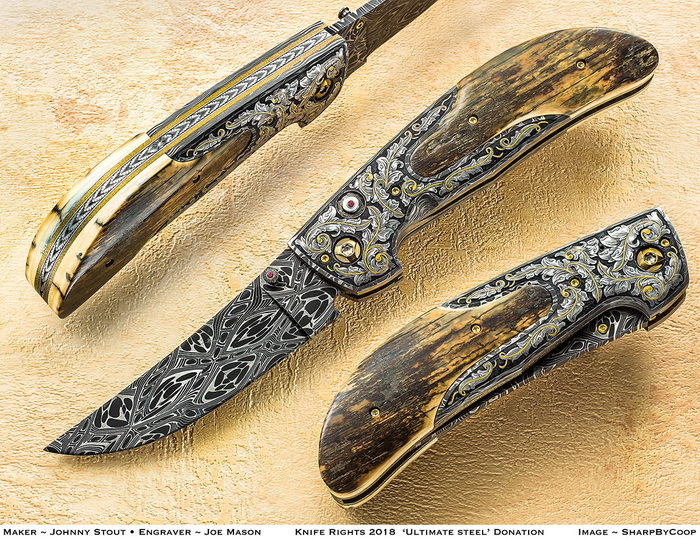 It features a dramatic 3.375-inch trailing point blade of Roller Coaster Mosaic Damascus by Chad Nichols. Matched presentation grade, museum fit, Mammoth Ivory scales finish off the 4.25-inch long handle, for an overall length of 7.625 inches. The interiors of the anodized Titanium liners are engine turned and stippled. All the screws are Gold plated. After almost a lifetime of being a knife lover and user, both as a sportsman and novice repairman, I began making knives in 1983, and became a full-time maker in 1992. Using ancient and exotic, as well as state of the art, materials, I offer fixed blade designs, as well as many fine folding knives with various locking mechanisms, to include various custom knives, switchblade knives, and my specialty, Gents’ folding knives. In my one man shop, each knife is built by me, one at a time, and made from a variety of USA made steels: carbon, stainless, and some of my own pattern welded Damascus, as well as other maker’s specialty Damascus. I remain committed to a highest level of attention to detail that is hard to find in the world today. I’m a member of the American Bladesmith Society and founding member and past President of the Texas Knifemakers and Collectors Association. For the knife enthusiast that have a desire to build their own knives, I offer three levels of knife instruction: Basic, Advanced, and Fine Folders. If you’d like to cut years off your learning curve, consider one of these classes, whichever will benefit you the most, and help advance your knifemaking skills. Just give me a call and let me know what you are needing, let me explain my methods, and we’ll work out a schedule for you that produces maximum results. I was born in 1947 and have always enjoyed crafting things with my hands. I enjoy fishing, woodcarving, knife making, and engraving. I made my first knife in 1994. Until now I have only made knives and engraved as a hobby. I have shifted most of my efforts to persue the craft I enjoy the most – engraving. I started engraving in 1995 and started engraving full time in 2008. I grew up in Jackson, Mississippi were I attended high school and college. After college, I was drafted into the United States Army and did my active duty in Germany from 1969 to 1971.